We broke down and bought an angle grinder. We were in Harbor Freight the other day and it was only $20, so I thought, what the heck. It even had a brand name. Not a brand name like one you'd recognize, but still, twenty bucks and it even came with a grinding wheel. We haven't used it yet, but we'll get some practice with it soon, and report back. We did use an angle grinder once, briefly, at our welder friend's house last year, and we didn't do any major damage. It was a nice one though, one of those real brands. The blue one, I think. 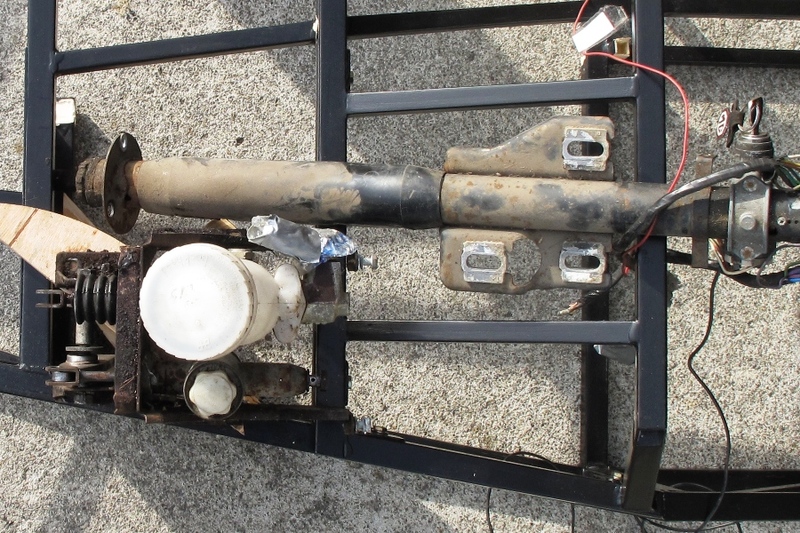 We'd been avoiding taking the dashboard apart in the donor because, quite frankly, we were afraid of it. As it turned out, we had good reason. It was a nightmare under there. Years of accumulated dust, re-routed wires, frozen heater controls, and tiny nuts and bolts holding it all together. Engineers at M.G. obviously made sure that no nut or bolt under the dash would be accessible by normal means. 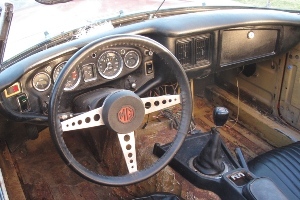 Steel structures to support the steering wheel and heater vents were welded into place, then bolts were cleverly added to fool you into thinking you could remove the offending pieces with a wrench. So we struggled for the better part of a day, starting on the left with the light switch, carefully labeling each removed wire, and even photographing some of the more esoteric connections, so we could pretend for the moment that we might be able to hook them back up again someday. We worked our way across the dash, gauge by switch by heater control, figuring out how each item was attached, assuming that everything would be engineered to install easily, but not remove easily because the factory doesn't do that part. Some things we didn't remove at all, like the little indicator bulb fixtures. You get them out by breaking them, apparently. We never actually got one out. 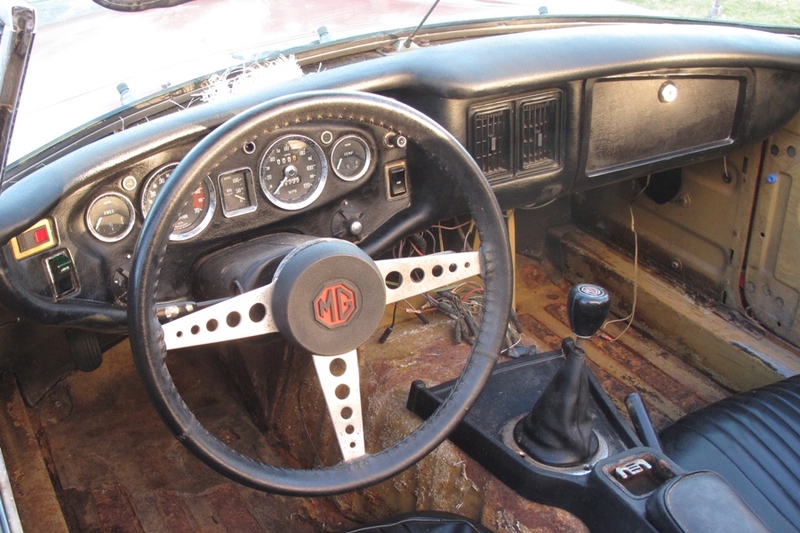 Every nut under the dash was rusted, some more than others, and no nut spun free after loosening. Nuts would cling tenaciously to that last bit of rusty thread, right at the tip of the bolt, defying the wrench to separate it from the only home it's ever known for the past 40 years. Did we mention these nuts were tiny? I think we did. 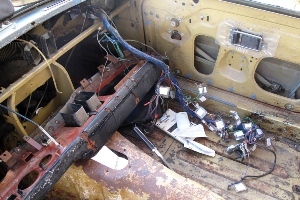 The dash itself was attached by only four nuts, so you might think it would've been better to remove the dashboard first, then take it all apart. And that would've been a spectacular idea if the four nuts were even remotely visible through the maze of wires, tubes, gauges, and aforementioned steel support structures. So it seemed as if the dash had it in for us, and maybe it did, but in the end we still won. The dashboard now lies face down in the rusted-out passenger compartment, guts spilled all over the floor, looking like it just lost a bar room brawl. Not that we feel much better. But that's the worst of it. All that's left is the suspension, hand brake, fuel lines, and fuel pump. The harness still needs work, but that's mostly lights. Pedals are out, along with the master cylinders. 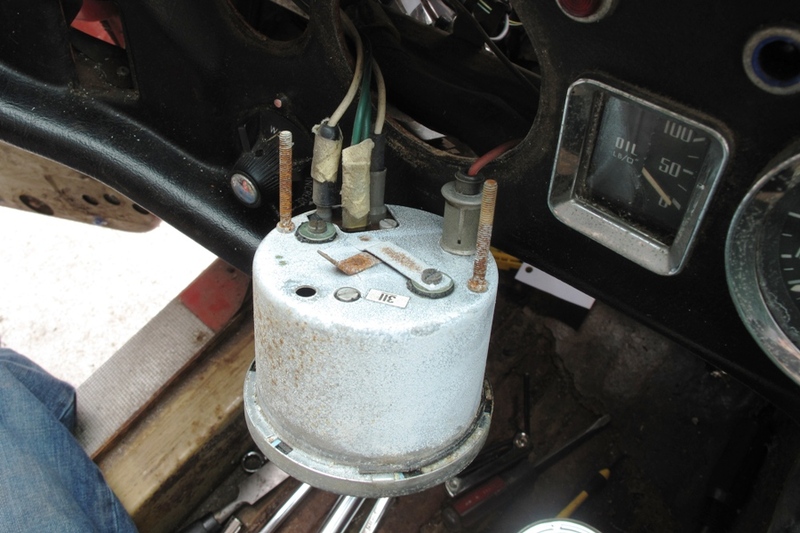 We tried fitting the pedals and steering column in the wood frame. Not too encouraging. I know it'll all fit one way or another, I'm just not sure how yet. The pedal box in the M.G. sits 15" off the floor. The shelf over the footwell in the Locost is only 13" high. So we have to build a platform for the pedal box, or else shorten the pedals. Either way, it won't be pretty.